We all live in a world of our own creation. We make our own life choices, anticipate and plan our futures and create our own happiness. We’re among the luckiest in the world, living in a country with ample opportunity and freedom. Often we forget this though. Our niggling problems or issues cloud our perspective. Sometimes it takes a story, experience or accident to discover our gratitude once more. Take a moment, before you continue reading, to remember how fortunate you are and that you have the ability to grow and prosper. We want you to meet Dr. Jill, a previous Bonfire Yogi changing lives in South Sudan. Dr. Jill works for Doctors without Borders, an organisation devoted to providing medical aid where it is needed most. Her and her team of experts see first hand the trauma, challenges and conditions of living in this environment and use their expertise to help in any and every way possible. They are strong, they are inspirational and they deserve more recognition than we could possibly give. We wanted to share Dr. Jill’s story not only to show that there are some truly incredible humans on this planet, but also the impact and power of yoga. To keep fit and maintain her sanity in South Sudan, Dr. Jill would go running. Great in theory, however the danger of being bitten by stray dogs carrying rabies was becoming too apparent. 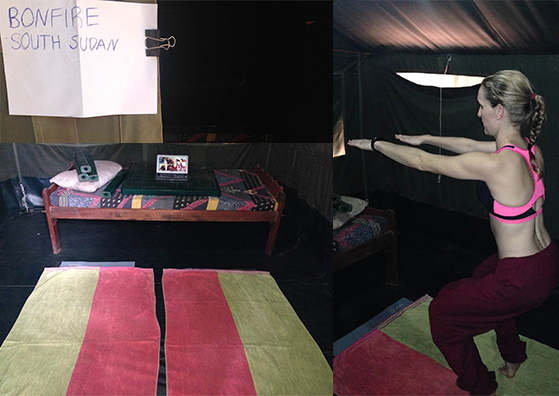 Instead, she has created Bonfire South Sudan; a sanctuary in her tent (which is organically heated), where she can practise her yoga. Bonfire organised Dr. A’s fantastic audio dialogue for Dr. Jill so she can practise and find peace in such a place. Please follow Dr. Jill’s journey – she is an inspiration and reading her blog posts will open your eyes to a whole other world. We are so grateful to have people like Dr. Jill in the world. Take a moment. Remember how fortunate you are. Spend time with the people you love. Think of others. Express gratitude. A big thank you to Dr. Jill for sharing your story with us. Thank you for all the work you and your team are doing. You are an inspiration to us all.